“A. Lincoln. Attorney and counselor at law. 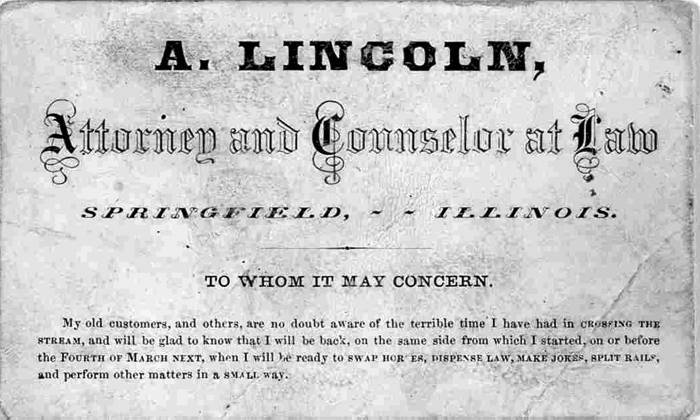 Springfield, Illinois … My old customers, and others, are no doubt aware of the terrible time I have had in crossing the stream, and will be glad to know that I will be back … ready to swap horses, dispense law, make jokes split rails and perform other matters in a small way [Business card of Abraham Lincoln, probably printed by the Democratic committee in 1864.] [Springfield? ].” 1864. An American Time Capsule: Three Centuries of Broadsides and Other Printed Ephemera, Library of Congress. “I will be back” = evidence that Lincoln was perhaps not a Vampire Hunter, but rather… the Terminator?